Smith Paint | Salmon Bay Sand & Gravel Co.
Smith Paint Products began manufacturing paint in 1929. They have developed thousands of specialized formulas for specific applications, such as concrete staining. Their Cement Stain line is environmentally friendly and water-based. Smith uses the highest quality raw materials and control in their manufacturing process to assure dependable and consistent products. Today, Smith products are used throughout the world. 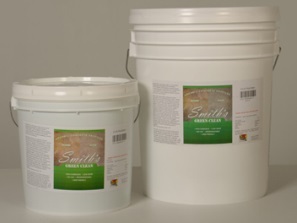 SBSG sells and stocks Smith’s Color Floor products. Smith’s Color Floor is a water-based extra-strength stain developed to give a decorative natural appearance to concrete floors and other porous mediums. Formulated as a user-friendly alternative to hazardous solvent and acid-based stains, Color Floor utilizes state-of-the-art acrylic polymer research and pigment preparation to ensure the highest quality results. Smith’s Seal WB is a single component urethane/acrylic-polymer based, high solids sealer for the decorative concrete industry. This product is clear, non-yellowing and easy to apply. Smith’s Seal WB offer great improved chemical resistance when compared to standard acrylic based curing and sealing compounds. The product has been formulated to seal and protect Smith’s Color Floor. Smith’s Green Clean is a non-corrosive biodegradable gel developed to prepare a concrete substrate by producing a moderate surface texture. From the machine troweled interior surfaces to smooth exterior slabs, Green Clean is the next generation in surface preparation.